...you realize that there are five finished objects that haven't been blogged in final form, nor even mentioned since you cast them on. Oooops! For the very first time ever Once again, I find myself in said situation. Here is the quick and dirty rundown. 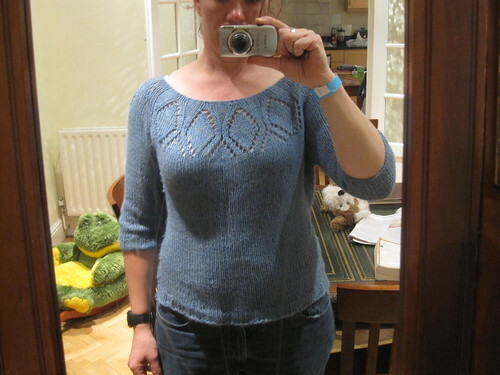 Neglected FO Number the first: my gorgeous, lovely Cadence pullover. Sorry for craptastic nighttime photo, but it's almost December and it's the UK. It's dark at 4:30 pm. I knit this up in nine days out of Artful Yarns Serenade (a cotton/angora blend). I was a bit dubious about the shaping of this sweater - to be more precise, the lack of shaping. As someone who bears a striking resemblance to either a pear or a warped board (slightly curvy) depending on the angle, I wasn't sure that a silhouette that tapered toward the bottom hem was going to be anything even remotely resembling good. Imagine my surprise when I found that with a bit of negative ease, it actually works quite well. My only complaint about this project has nothing to do with the pattern and everything to do with the yarn. The yarn is soft and lovely, and seems to have a bit of resilience not normally found in cotton yarns, which is a very good thing. 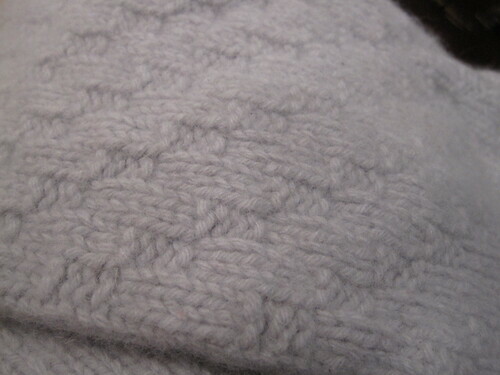 However, this particular yarn is extremely friendly, and prone to leaving bits of itself everywhere. And I mean everywhere - I need to lint brush myself a couple of times a day when I've got this thing on. Never again with the angora! 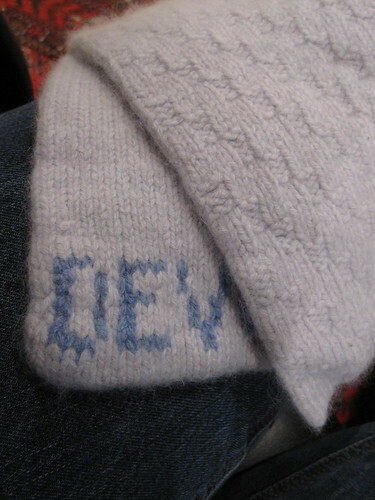 Not-quite-so-negelcted FO Number the second: Devil's scarf. Yarns were recycled from some ancient Goodwill treasures, and I vaguely followed the pattern for Marty. I ended up knitting a big tube for this, because I didn't want it to curl and I wanted to knit her name on the back to hopefully prevent it's being lost within the first two weeks of use. It's nice and thick and warm and soft, and she's been quite pleased with it - blue to match her school uniform, but a softer, paler blue which she seems to like. I've also got an Aran Necklace camisole to talk about, but that one requires some surgery to become wearable-without-being-arrested, so I'll save that process for another post. Ta ta! 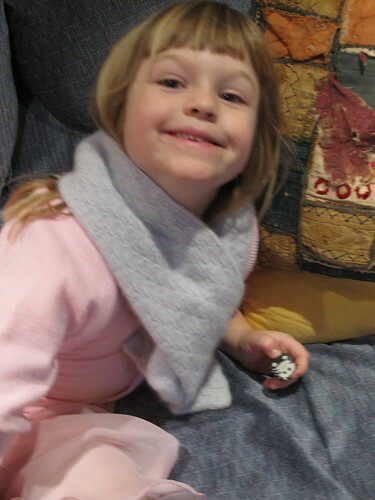 Written by porpoise On November 23, 2010 In "FO", "scarves", "sweaters"